← Git wrecked son! Standard brewing with The Gitrog Monster. 2016 has been a year about growth and change for us here around the shop. One of the policies we have tried to change from 2015 was the way that we handled tournaments and our prize payout structures. I wanted to take this opportunity to go over what our goals for these changes were from January to April, and what I have learned in order to present the community with a better system moving forward for the rest of the year. So here’s to you, Ms. Prize Support: You’ve always been a fickle mistress. January brought on our attempt at creating interesting high-impact prizes based around a particular buy-in rate. The Theory: Create an atmosphere for each tournament where the buy-in was reasonable based on the high payout of prizes. We wanted to establish with the community that each month we would try our best to provide high quality prizes based around some of the most played decks for their format. In doing so, we hoped that the community’s response would be to come and fight for the chance at winning some of these highly sought after cards (that typically have price tags slightly too high to justify purchasing on a whim). The Event: January’s Modern event was by far the biggest turnout we’ve had as of late for a weekend event outside of a Pre-Release. We were excited to see so many players out to test their chances at walking away with a Tarmogoyf. The problem with this style of event was that it put quite a price tag on the players for delivering such expensive prizes. And while we did our best to keep the prize pool interesting and alluring moving from January forward, we noticed that the player pool had plummeted from January’s initial turnout. As the Tournament Organizer for the store, this drop in players worried me. I wanted to make sure that the community had not lost interest and that we were still providing high quality prize support for each event that we ran. What I found in my surveying of our local players was, while the prizes themselves were noteworthy by-and-large, the steep buy-in price of events was scaring players away who felt they didn’t have a good chance of ending up in Top 4. What this created was 3 months of events that had 4-6 players vying for the Top 4 spots, as those savvy enough to realize the small turnout meant guaranteed prizes for those willing to show up, at a hit to the store (morally and financially). Again, as TO it hurt me to hear people sitting in the store saying that they didn’t feel like playing in an event because “there were already 4 players, so I won’t be guaranteed anything”. We want every player to feel that their tournament fee is going to something worthwhile for them. I would hope that the experience of the event would make you happy that you spent your time playing and hanging out with friends, perhaps learning something new about the format. In doing so, you could potentially make Top 4 yourself with some determination, hard work, and maybe a little help from the Magic Luck Gods. But the experience and fun of the event did not quite justify the price tag. The Theory: We still pride ourselves on trying to present the community with prize support that rewards those for coming to events and giving their all. What we have done for May (and the foreseeable future, if all things end well), is come up with a new prize structure and payout for our monthly events. Hopefully, these new changes will bring a surge of players back into the tournament scene, now that the bar of entry has been lowered substantially. The Events: Each event in May will have an entry fee of $15 or $10 if member/Pre-reg. Our pauper event will have its normal buyin of $10 or $5 if member/Pre-reg. The prize payouts for each event (though slightly different for Standard), will make sure that there is a minimum of 20% added to the total entry pool given away as prizes. The key thing to note about entry fee to prize pool conversion is that we are basing each player’s contribution for the event on the max entry fee. What this means is, if a player pre-registers or is a member, we are still adding in the full value to the prize pool as if they paid the normal price. This puts a great incentive in for players that know they are coming to an event and want to cash in on the pre-reg bonus, without hurting the prize pool at all. We’ve also moved toward paying better for 3rd and 4th place, guaranteeing that each receives more than the entry fee for the event they entered. For those of you who have been coming to the shop for some time, you may think this is a return to what our tournaments used to be. This is only partially true. The difference between our old tournaments and these, are the lessons we learned from January to April, and how we are going to use that knowledge for the benefit of all. 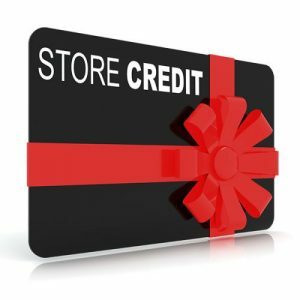 While we are departing from tangible prizes to the return of Store Credit, our philosophy on how to handle credit, and prize payouts as a whole, has changed quite a bit. We hope that these changes do not go unnoticed by the community, as we are constantly trying to better ourselves to give you the highest quality events we can. This entry was posted in Articles, Event, Magic The Gathering and tagged Magic, Store Credit, Tournaments. Bookmark the permalink.